We welcome your live in-person attendance at our auctions in Denver, PA and Las Vegas, NV. Our headquarters in Denver, PA includes one of the largest under-roof auction houses, spanning over 45,000 sq. ft. The pride of the facility is the stylish auction room, featuring comfortable theater-style seats equipped with fold-over lap desks and cup holders, a marble floor and decorative tin ceiling with ambient lighting. 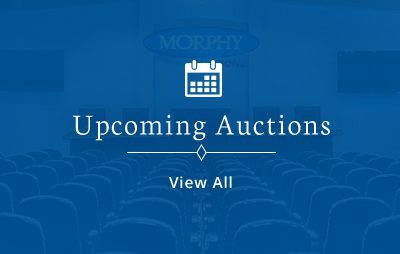 With technology constantly changing, Morphy’s strives to offer state of the art options for bidding and auction participation, which the facility was designed to handle. The auction room’s design features the latest telecommunications, wireless technology and custom acoustics for the best auction experience possible. Adjacent to the auction room is a sleek and comfortable dining facility equipped with an audio-feed function and windows to enable bidders to monitor the auction activity while grabbing a bite to eat. The facility also has an outdoor patio which provides a nice area in which to take a break from the auction.